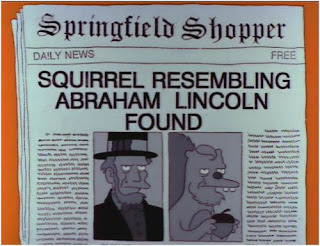 A brilliant and unique episode which largely turns the spotlight away from the Simpson family, giving us the chance to spend a day in the life of Springfield's other residents. 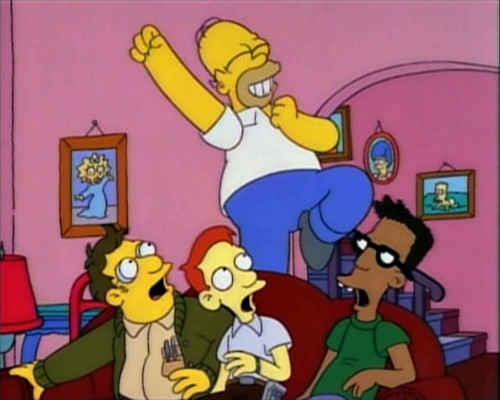 We see Apu leaving his post at the Kwik-E-Mart behind for five minutes of partying and merriment, Principal Skinner hosting an embarrassing dinner for Superintendent Chalmers, Cletus finding a free pair of boots for Brandine, and the Very Tall Man makes his first appearance, giving Nelson Muntz a taste of his own medicine. 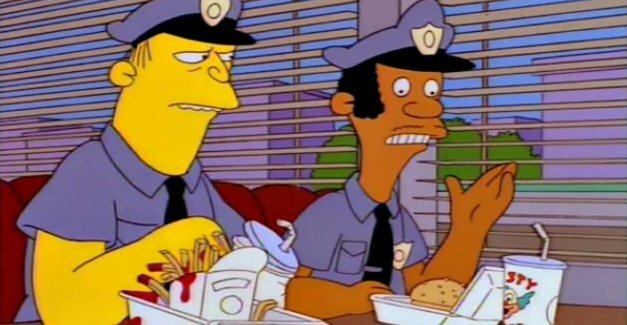 Best of all, though, are the hilarious segments which pastiche Pulp Fiction - Chief Wiggum, Lou and Eddie discussing the respective merits of Krustyburger and McDonalds being a particularly funny scene. All of that, and there's even time for a bit of tomfoolery with Professor Frink. This was the show at the peak of its powers, demonstrating how a living, breathing city had developed as a backdrop for its central characters. "Chairman of Medical Board: Dr. Nick, this malpractice committee has received a few complaints against you. Of the 160 gravest charges, the most troubling are performing major operations with a knife and fork from a seafood restaurant. Dr Nick Riviera: But I cleaned them with my napkin." " Wiggum: Do they have Krusty partially gelatinated non-dairy gum-based beverages? Eddie: Huh, shakes. You don't know what you're gettin'." Getting to close to the business end, now, with this fantastic summer camp episode. Bart and Lisa have spent all year looking forward to the only camp which meets the high personal standards of Krusty the Clown. When they get there, however, they're greeted with the worst camp in the world, run by the despicable Mr Black - the nature hikes have become grim death marches, and the arts and crafts centre is, in actuality, a Dickensian workhouse. 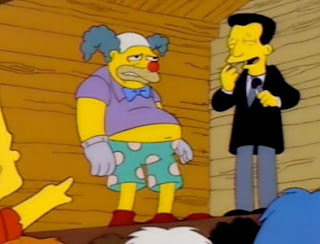 It's only when Mr Black attempts to pass off an inebriated Barney Gumble as Krusty that Bart can stand no more, and leads a revolt against the revolting camp counsellors. It's just an outstanding episode from start (Bart's vivid dream of destroying the school) to finish (a montage of Krusty leading the kids to the happiest place on Earth - Tijuana). "Homer: Now Bart, we made this deal because I thought it would help you get good grades. And you didn't. But why should you pay for my mistake? Bart: You mean I can go? Homer: Yeah. I didn't want you hangin' around all summer anyway." "Kent Brockman: Ladies and Gentleman, I've been to Vietnam, Afghanistan, and Iraq; and I can say without hyperbole that this is a million times worse than all of them put together." In which one of Bart's trade mark pranks backfires, and he finds himself trapped down a well. After various attempts to rescue the boy fail, the whole town (and Sting) takes part in a good old fashioned hole digging in a bid to get him out... This is the first of two episodes from the wonderful Season Three - probably my favourite season of the show. I've been rewatching that season recently, and almost every episode is fantastic, but this episode is particularly dear to my heart. It was my favourite when I was growing up, and I've seen it so many times I can practically recite every line. In fact, the jingle from the Wall-E-Weasel animatronic robots is playing in my head right now. Ready, Signor Beaverotti? "Fisherman: With this hook, and this hunk of chocolate, I'll land your boy - and I'll clean him for free!" "Kent Brockman: This is Kent Brockman with a special bulletin. 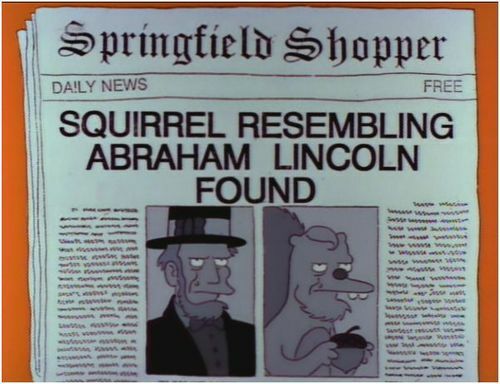 The Lincoln Squirrel has been assassinated. We'll stay with this story all night if we have to." Another episode from Season Three, and it's another absolute peach. When Bart and Lisa take a career aptitude test, Bart discovers that his future could lie in the world of law enforcement. Meanwhile, Lisa is devastated to learn that she has inherited a genetic condition known as 'stubbiness' from her father, dashing her dreams of becoming a famous saxophonist. This state of affairs leads to a brief role reversal, with Bart Simpson on the side of law and order as a hall monitor, and Lisa experiencing the giddy thrill of futile rebellion. This episode provides that perfect combination of sweetness and cynicism that the Simpsons, at its best, could always be relied upon to provide. It's also a brilliant demonstration of the relationship between Bart and Lisa - though they may have their differences, deep down, they know they can count on one another. Bart sums it up best in the final lines of the episode: "You got the brains and the talent to go as far as you want. And when you do, I'll be right there to borrow money." 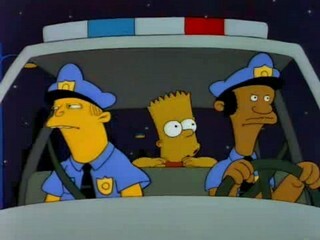 Chief Wiggum: Looks like you just bought yourself a lottery ticket. To jail! Wiggum: Ah, they can still hear things." "Principal Skinner: I saw some awful things in 'Nam, but you really have to wonder at the mentality that would desecrate a helpless puma!" "Dean Peterson: Hi there! Hello, I'm Dean Peterson, but you can call me Bobby. I just want you to know if you ever feel stressed out from studying or whatever, I'm always up for some hackey sack. Or, hey! If you just want to come by and jam, I used to be the bass player for the Pretenders. Homer: Boy, I can't wait to take some of the starch out of that stuffed shirt." "Dean Peterson: Hello... that sounds like a pig fainting!" Good List, whoever you are..